Mya Beets (left) and Zoey Beets raised $420 for Cincinnati Children's Hospital Medical Center. 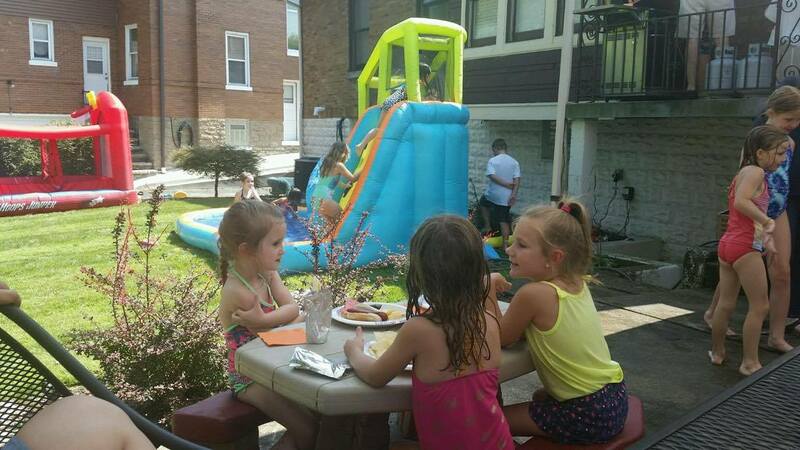 Last February now-7-year-old Zoey had an idea: She, along with her now-5-year-old sister Mya, wanted to throw an outdoor water party for friends to raise money for Cincinnati Children's Hospital Medical Center. Her parents, Fort Thomas residents Angel Beets and Marty Beets, said no, because, well, it was winter. "She asked again last spring and I brushed her off," Angel says. "Then she asked at the beginning of summer and life was just too busy. So when she and Mya both asked in August, Marty and I realized we were out of excuses. We found a weekend and told them to go for it. How could we possibly say no to something like this? They've always had huge hearts and Zoey has said for years she wants to work at Children's someday or run an orphanage." 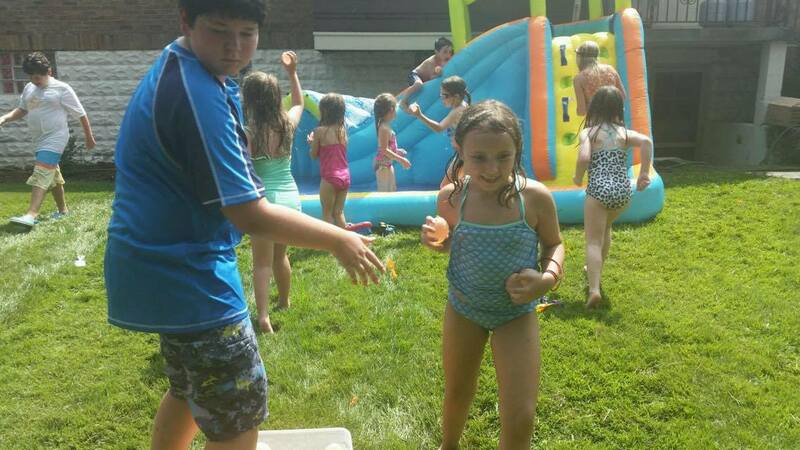 Friends and neighbors cool off at Zoey and Mya's water party. So, Zoey, a second grader at Woodfill Elementary, and Mya, a kindergartner at Country Hills Montessori, threw their water party, late August. And it was a big success. The sisters raised $420, from family, friends and neighbors, much of which came from their friends' personal piggy banks. Three years ago Dena, a family member, had heart surgery at Cincinnati Children's Hospital Medical Center when she was just a few days old. Mya says it's one of the reasons she wanted to donate the money to that particular hospital. "And also because it's the hospital that needed it the most," Mya says. This is an advertisement. 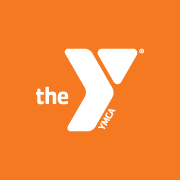 The Campbell County YMCA. Zoey also wanted to donate to the hospital because, "Dena had her heart surgery there and I love her," she says. And then, of course, there have been friends with broken bones. "I see lots of people with broken arms and I always thought they might have gone to Children's Hospital," Zoey says. Of course, any fundraiser requires a lot of work. "At dinner we all talked about it and made plans," Angel says. "Mya grabbed a notebook and four highlighters so each person's ideas could be a different color. I'm not sure why this mattered, but hey, it was cute." Angel and Marty gave their daughters a budget of $100 for food and anything else they would need and explained that they'd have to repay that investment before they could make the donation. "It was always our intention to donate that money in the end, but we wanted them to at least understand it takes money to make money," Angel says. "Zoey really wanted to serve steak, but settled on burgers and hot dogs once we explained how much steaks cost. The deal was, Marty and I would help, but they had to run the event. They were in charge of coming up with the activities, doing all the promotions, planning the menu, making a map of where everything would go and counting the donations. They even helped with set up." It wasn't always easy sailing. "We had many rough drafts," Zoey says. "We had problems along the way, but it all got cleared out in the end." Zoey and Mya took flyers around the neighborhood and to their friends' houses. They also asked their mom to text people pictures of the flyers. Forty-one guests showed up. Children splash in a pool and play with water balloons. 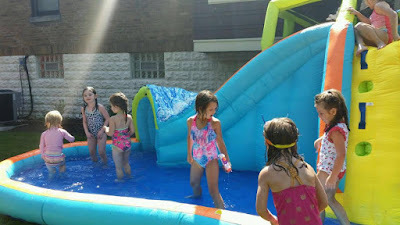 Mya says they chose a water party because they thought it would be fun for everyone to bring their swimsuit and splash around. "It seemed like it would be a good thing to do on a hot day," Zoey says. "If we were outside, everybody would be hot and sweating. But if we got in a pool, we'd feel really good." Zoey and Mya planned the menu and made a map of where everything would go. The set up was impressive. 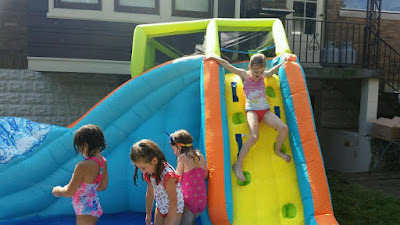 "We had a roller coaster—like, just one that goes down—and a water slide with a big pool space and we had a dry bouncy house," Mya says. There were water balloons, too, Zoey says. When guests arrived they made a donation. "I think everyone who gave money was great," Zoey says. "They did a good deed for the children who need it. I was thinking, oh, maybe we'll raise $100 or $200, nothing major." They raised more than double that. "It was a lot of money," Mya says. "We didn't know we'd make that much money. I said our goal was $300." 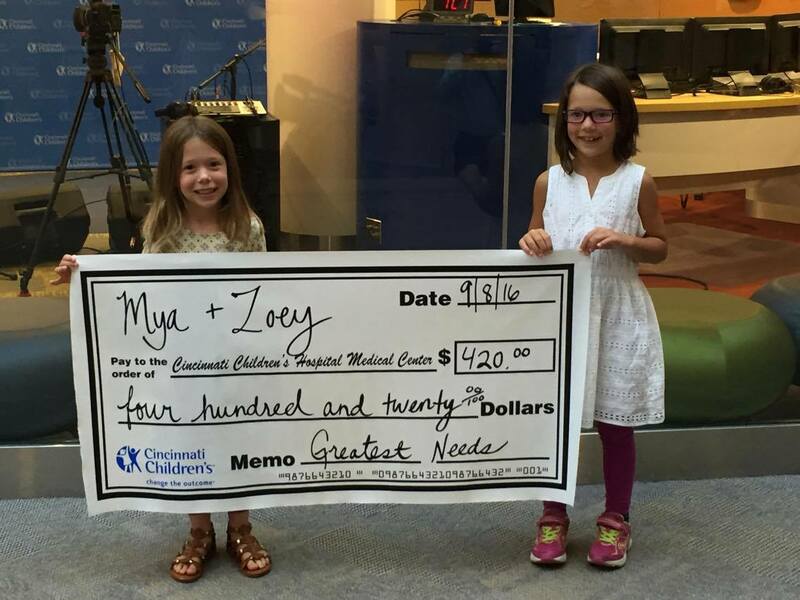 Cincinnati Children's Hospital Medical Center asked Zoey and Mya if they wanted to designate the money to a specific area or greatest need. "We chose greatest need," Angel says. "After the check presentation, Jane Livingston, the Donor Relations Officer at Children's, told the girls if they do the event again next year they can get a tour of the hospital and see the different areas. Then they can make a decision about a specific donation." For Zoey and Mya, presenting the check was a big deal. "It kind of felt like actually going there to work," Mya says. "I felt happy." Zoey says it was great. "I felt excited," she says. "I was so amazed at all the pretty things. I asked them about how the money would be used and they told me it will be used on what it's most needed for, like maybe a new microscope or to help the children get fun toys." The water slide was a big hit. Mya says she'd like to do it again next year because, "I like raising money and it's fun inviting friends and family over," she says. "I learned that fundraisers can be a little tricky to handle sometimes 'cause you have to buy the food, you have to be in charge, show people where the drinks are and where the potties are. It's just hard work." Angel says her daughters say they want to do it again next year and make it bigger, but she and her husband agreed they're not going to mention it. "If they bring it up and want to manage the project again that's great," Angel says. "But if they just want to leave it at a one-year event, that's fine, too. We want it to come from them."